The histories and stories told in this exhibition are too vast to reflect in something like a review - how to outline how a country of hundreds of millions of people can undergo a complete change of regime, a change of collective psyche. A total cultural revolution touches the life of every citizen, and the power of image was a major tool in promoting ideology in every aspect of life. The RA has collected work from individual, collective and famed artists, and artefacts from unknown workers. There is a progression through time, with no starting echo of what had just come before. From a century on, this is what ideology looks like when the state is attempting not just mind control but aesthetic control also. The glorification of the noble worker, the forward-looking mechanisation and communist ideals of course masked the terrible human cost which artists portrayed at their peril. What a sense of the energy of the beginnings of the start of the twentieth century and really the start of the modern world. 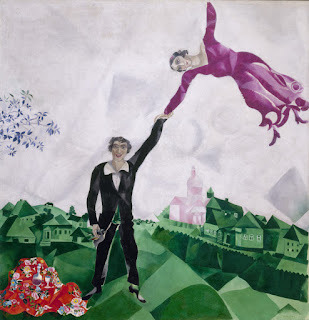 There are too many highlights to note, but a couple of days on from visiting, the works I am still thinking about include Promenade by Mark Chagall. I thought this painting would be much smaller, and somehow much less...Soviet. Seeing it deep within context makes the flight of fantasy seem even more magical at a time when such individualist expression was seen as decadent. The sense of folk art it evokes is also reminiscent of the work artists were at the time also referring to a supposed golden and pure peasant past. Tram conductor by Alexander Samokhvalov, another glorification of the nobility of the worker, is stunning. The figure is oddly illuminated in a neon blue cast by the new electrification and modernity. Sturdy and imposing, she carries out her duties like a queen of this new world. Personally I tend not to partake of audio guides at galleries, as I prefer listening to my own thoughts and having unmediated discoveries, and so I don't know if the RA provides apt music in their guides. Photographs of composers put in mind that the perfect accompaniment to the exhibition would be some of the relentless symphonies of Shostakovitch and the magical inventiveness of Prokofiev. Occasionally in museums, perhaps amongst the harpsichords, a little appropriate music is quietly played in the background, adding atmosphere and context. In this vast exhibition, covering such traumatic years in Russian history, image was the medium used to reiterate message, through paintings, photography, film and artefacts, and yet music is also an intrinsic part of such culture. Once noted, its absence seems almost like an omission. A peddled flying machine is such an idealistic enterprise. It rotates in its room at the RA, beautifully lit to cast shadows. Thoughts of insects, bird skeletons, Michelangelo, eccentric Victorians. A chance remark by another visitor who told me he had just visited a futuristic exhibition in Tokyo with similar structures, evoking alien creatures. In an exhibition so bound with a sense of place and time, Letatlin speaks of the shared push to the future and the space race which was to come later, once so many millions of people had paid so very dearly in transforming the soul of a country.